The DeKalb County School System grounds crew appeared at the school on Thursday. It looked like they were just trimming the crepe myrtles, although they were a bit extreme. Friday they were back and when Kaye Smith drove by she noticed they were bulldozing trees. Trees that had been planted as memorials; trees that the Medlock kids had planted for the victims of the Oklahoma city bombings. She "engaged in conversation" with the crew then she started calling folks. She was able to get a supervisor to come down to the school and as more neighbors arrived, the supervisor called his boss and it was finally agreed that the Children's Garden would not be bulldozed. The community will be allowed to maintain the children's garden as well as maintain the plantings along the front of the building.The school Board grounds crew will still mow and maintain the trees. 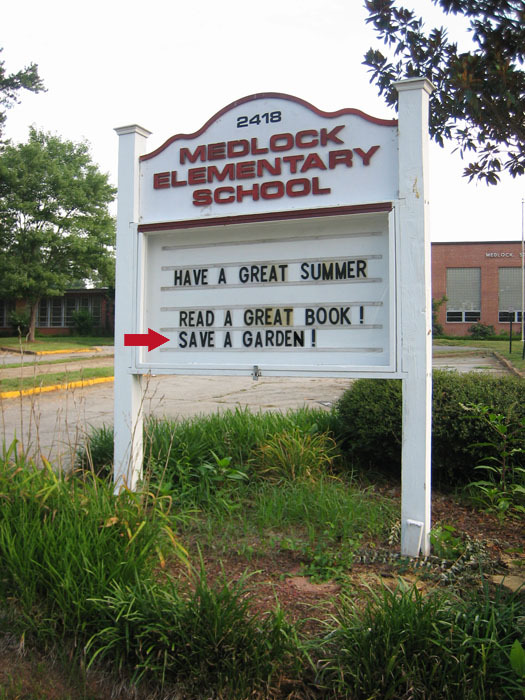 We will be setting up a group to maintain the gardens in association with the Medlock Park Community Garden. An initial meeting for planning will be announced soon. - Medlock Neighbors do not want a cell tower in our midsts, as outlined in the online petition.